Combine butter with 1/4 cup confectioners’ sugar in a bowl until smooth; stir in 1 cup flour. Press dough into prepared baking pan; pierce crust with fork in several places to prevent crust from puffing up during baking. Bake crust in the preheated oven until slightly golden brown, 10 to 15 minutes. Let cool. 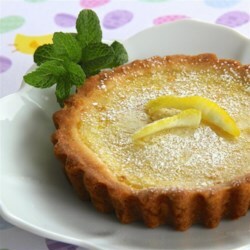 Whisk white sugar and eggs in a bowl; stir 3 tablespoons flour into mixture and add lemon juice, lemon peel, and salt. Whisk until thoroughly combined. Pour mixture into baked tart crust. Bake until filling is set, 20 to 25 minutes. Let cool and dust with 3 tablespoons confectioners’ sugar.